Spielgaben 10 is the final set, and involves one of the most critical elements of geometry: the point. 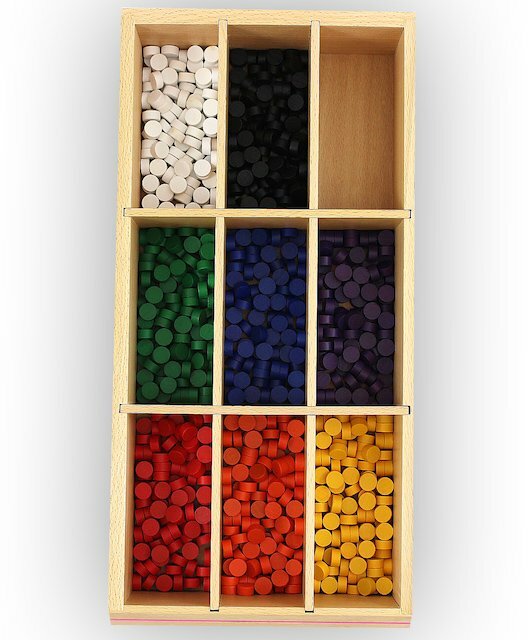 It contains points in eight different colours. These points are small and can be swallowed, so make sure to keep them away from children under the age of three. The Spielgaben move from the large to the small. At this stage, the child is introduced to the most basic geometric concept: the point. Spielgaben 10 makes the point tangible. It is real and solid. By placing the point between line segments, the child intuitively understands how a point allows a line to change direction.Use them as counting aids, to play sticks and peas, to create borders or to teach patterning and sequencing. These pieces are much smaller than any of the objects children have encountered up to this point. You’ll find that the small size of the points strengthens eye-hand coordination and fine motor skills. It also allows children to think in terms of more detailed designs. Not only will they be able to place a point between two lines to help it move and intersect, but they’ll be able to take the small points and turn them into patterns and pictures. For example, a child may arrange the points in the image of a flower, noting where the color of the stem ends and the color of the petals begins. They may use the points to make a face, inserting the parts of the eyes or the definition for the mouth in a solid-colored surface. The points can also be used to help children reinforce their understanding of other shapes. For example, after creating a triangle with the sticks, children can place the points on the points of a triangle to provide them with a new visual representation of a shape. The same can be done for squares, rectangles, diamonds, parallelograms, and shapes with more sides and angles, such as hexagons and octagons. Children may also use the points to divide a straight line or mark points on a number line. In letter representation, the points become a simple way to include the dot on a lowercase j or i.